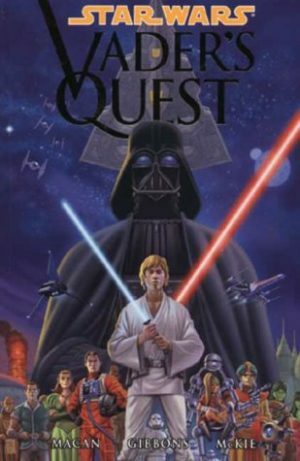 The status quo that’s held since the beginning of Knights of the Old Republic is no more. 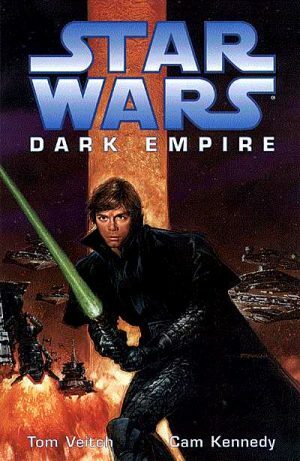 A secret cabal within the Jedi Knights has been rooted out, and Zayne Carrick has proved his innocence. Vindication left him with a clean slate, and he, Glyph, Jarael and Rohlan have settled on a career of adventuring, freebooters stealing from crooks. With the new wider basis for the series established, John Jackson Miller presents three very different stories. The title tale finishes the collection, a three part glimpse into the underbelly of organised sport and organised betting. Zayne’s delighted to be at the centre of the Franchise, a galaxy wide sport with the fatal element now removed. Glyph’s also happy, as he’s discovered bets pay out on transmission, and there’s a slight delay in the live feed, but what wasn’t part of the plan was Zayne and Rohlan’s participation. 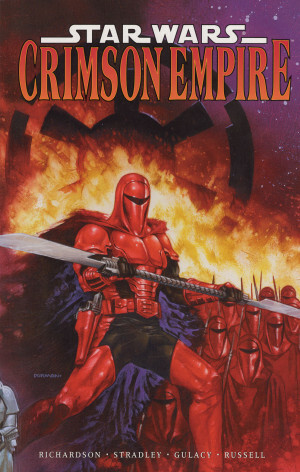 Before then there’s a staged con on another form of betting, investment in potential mineral gains in planets now off limits due to the Republic warring with the Mandalorians, and the discovery of a drifting space cruiser with everyone dead. It’s the sports story that’s the best. While Miller has some pointed comments about the frailty of stock market investment, there’s a greater emotional undercurrent to ‘Duelling Ambitions’ as the scripted ethos of real world professional wrestling is transferred to a more complex form of motorised combat. There’s a deeper plot providing the pathos, eventually leading back to someone seen earlier in the series, and a greater sense of danger. While we know it’s unlikely any of the regular cast will meet their demise, there are other characters to care about, which isn’t the case in the other stories. Brian Ching’s back to illustrate the sport special in his loose style, his designs in places looking like the work of Cam Kennedy, fitting for a story that could also slot neatly into 2000AD’s science fiction. Bong Dazo’s No Neck is as bizarre a creation as any seen in the series to date, and new artist Dean Zachary has a different look, working in a gritty pencil style with a strong design sense. One of the few remaining mysteries to Knights of the Old Republic has been Jarael’s past, and just what it is within her that’s been recognised by several people she’s met. 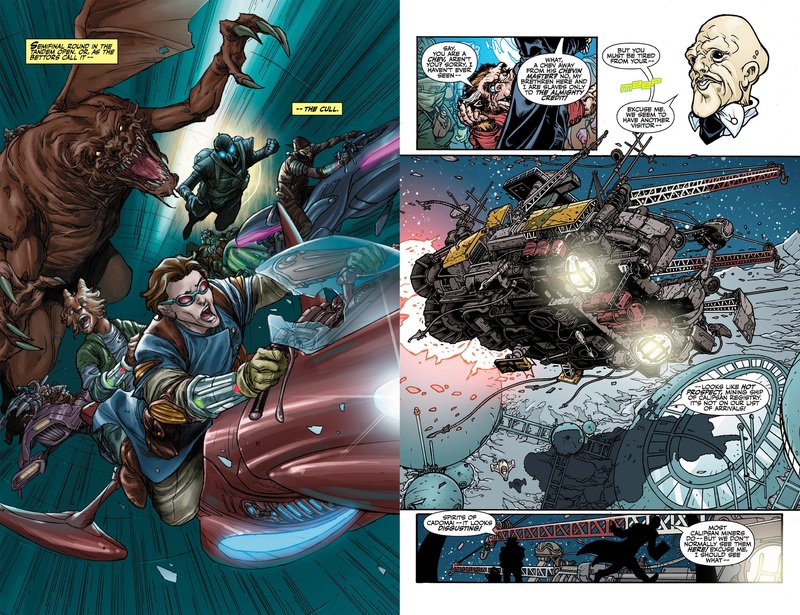 The final pages drop a bombshell about that, and revelations about her continue in Destroyer. It gives a purpose to what’s been a somewhat directionless collection. These stories have their moments, but don’t match the tension and thrills of the earlier volumes. 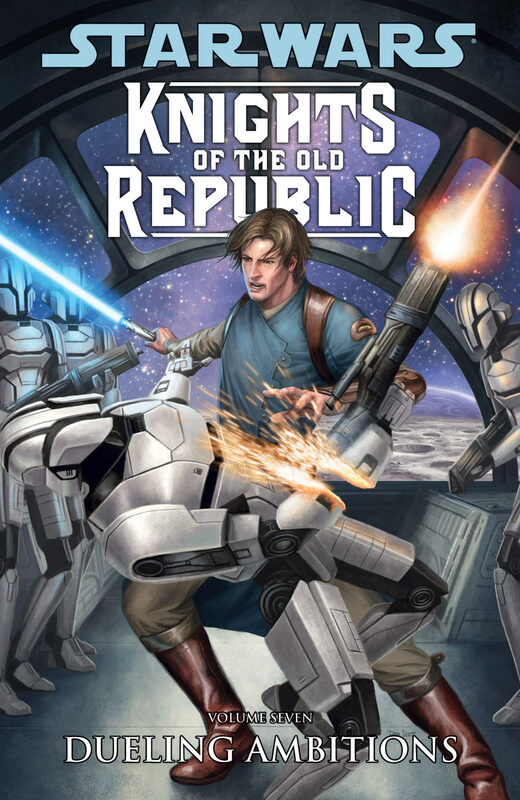 The opening two chapters are collected in volume two of Star Wars Legends: The Old Republic. 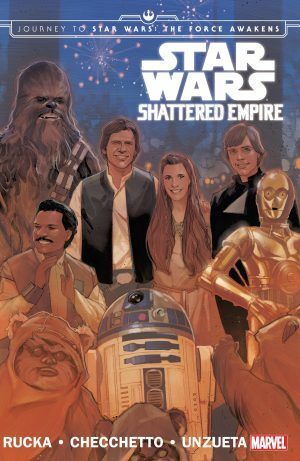 In the fullness of time the remainder will probably arrive in volume three, but for now they can also be located in the now out of print Star Wars Omnibus: Knights of the Old Republic Volume Three.